fish passage mitigation banking program in Oregon’s North Coast that could do just that. 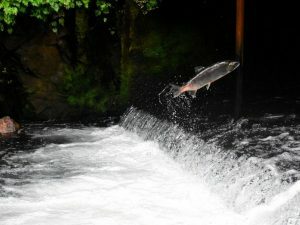 Oregon’s Fish Passage Statute requires that for a given project, fish passage must be addressed wherever fish are currently or were historically present. Under their Habitat Mitigation Policy and Fish Passage Rules, Oregon Department of Fish and Wildlife (ODFW) also has authority to allow for mitigation (i.e. alternatives to providing fish passage at an artificial obstruction) if it results in a net benefit to native migratory fish. current net benefit analysis from a case-by-case determination of whether a single mitigation project is adequate or sufficient to offset impacts from a single site to a system whereby impacts to habitat are debited in limited amounts from fish passage mitigation banks — locations where high priority barriers are removed and significant benefits for native migratory fish are created. 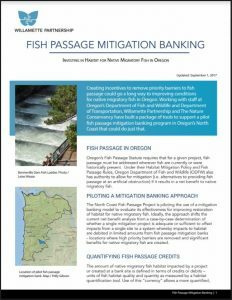 Download the Fish Passage Mitigation Banking Fact Sheet to read more.